Michael Patton posted recently that he thinks that people lose faith because of lack of discipleship and he mentioned in passing that Christians used to believe the world was flat. That Christianity didn't teach a flat earth doesn't change the thrust of his argument. Nevertheless, I offered my thoughts as this lie needs to die. In response to this others claimed that the Bible teaches a flat earth. ...the idea of a “flat” earth is presented in the Bible, simply because that’s how the people envisioned it back then. They’d go up onto a mountain top, look around, and see a round, disk-shaped earth. That’s all they knew, and God no where in His Word sought to obviously correct that understanding. I think any “scientific” statement in the Bible is best understood by the science of their day, not ours. The cosmology presented in Genesis is incredibly similar to Egyptian and Babylonian cosmology. Not in its theology, just in its structure. Sometimes we like to think that the Israelites developed their culture and wrote the Bible in a vacuum, that there was no influence or sharing of ideas between others in that same era and geographical location. I’ve noticed that Christians tend to try and explain this kind of stuff away so we can make the Bible conform to our modern understanding of science. We have this misplaced idea that to be reliable, the Bible needs to match our understanding of everything, or that if there’s some borrowed stuff from Babylon or Egypt that its any less inspired. We sometimes forget that the Bible was written for us, but not to us. God inspired in a manner that would be meaningful to ancient Israelites. He accommodated Himself to them by taking their cosmology and reinterpreting it in light of Himself. Its really quite fascinating when you read Genesis with this in mind. You come across a whole mass of information and meaning that we moderns tend to overlook because we just don’t think that way anymore. And he recommended the article A Common Cosmology of the Ancient World. I have only read some of this and would like to respond to it in more depth at a later stage. For now I wish to make a few comments about assumptions in Greg's quote and then a few thoughts on the flat earth question. poses problems. Firstly science in the modern sense dates back a few hundred years. Rather statements of this type in the Bible are factual claims. Granted they may come from inference rather than direct observation but they are not scientific in the way we understand the term. Further many modern "scientific" claims are claims of history not operational science. There is much truth in understanding the Bible on its own terms not ours, but "own terms" is about how the Bible uses language, not its objective claims. The ancient Israelite concept of what constitutes "life" may not fully correspond to ours, but Jesus either rose from the dead or he did not. He accommodated Himself to them by taking their cosmology and reinterpreting it in light of Himself. is a significant claim. Agreed, God does not have to correct our misconceptions. And not doing so does not give tacit approval. But statement says that God tells us our misconceptions are correct when they are not. I disagree. Sometimes we like to think that the Israelites developed their culture and wrote the Bible in a vacuum, that there was no influence or sharing of ideas between others in that same era and geographical location. I am not certain who holds to the Bible being written in a vacuum. Israel clearly interacts with the nations thru-out both Testaments. They constantly shared ideas with their neighbours, much to God's displeasure. The proposal that God hated the behaviour of the pagan nations and constantly told Israel not to emulate them and repeated told them not to worship foreign gods or adopt their practices, yet borrowed their incorrect structural cosmogony seems unlikely. To flat-earthism. I note that the objection is a slightly different point to the one I made. I have previously posted that the sphericity of the earth was documented as least as early as 500 BC. Patton's comment was about Christianity teaching a flat earth. The history is that Christianity has, by and large, taught a spherical earth when addressing the topic. The most that can be said is that some argued against antipodean lands and/ or inhabitants for reasons unrelated to the earth's shape. As mentioned, I hope to post later about the claim about the Bible teaching a flat earth. For now I have several general comments. Because the flat-earth myth was invented by infidels in an attempt to discredit Christianity, in any discussion about earth topology Christianity should be given the benefit of the doubt. 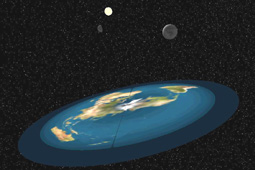 Geocentricism is not the same as flat-earthism. "Evolutionary thinking" is much more pervasive than we realise. For example the idea that polytheism developed into monotheism is an social evolutionary idea not a biblical one. The Bible suggests the reverse. Why should every other text (and theory) be the standard to which the Bible is compared? If the Bible and any particular text disagree why is it assumed the Bible is in error? Accounts recorded by Scripture and other cultures could be due to common memory. If there is borrowing going on it may be from the Bible (or possibly source texts in the case of Genesis) to other nations than vice versa. A comparison of texts is helpful. Poetry frequently talks about real events and uses literal wording at times. However features of poetry include the frequent use of symbolism and metaphor. When reading poetry it is important to understand the point being illustrated, not insist on the literal meaning of the underlying wording. If a poem uses a phrase that is intended to be literal or does indeed coincide with reality then it is not unreasonable to use the passage as support that the author understood this particular concept. It is not valid, however, to force literalism on a poetical passage. The second ethical issue that has become prominent during the Gaza/ Israel conflict is the death of civilians. Is there an excessive loss of civilian life in the conflict and who bears this responsibility? The deliberate targeting of "enemy" civilians. Combatants choosing high density civilian areas and structures from whence to perform military operations and store munitions. Planting explosives near civilians to maximise damage by enemy fire. Similar to my previous post, a tally of numbers, while giving some information, is a simplistic way to analyse civilian casualties. It says that X number of civilians from territory A are dead. B is at war with A. Therefore B is responsible for X. This analysis lacks assessment for intention and assumes that the killer is morally responsible for the death. Conversely, an attack that targets combatants yet also kills some civilians should be assessed based on the underlying intent. If the target is legitimate and attempts are made to minimising civilian death (while still achieving the objective) then these are unfortunate casualties of war. One can argue that minimisation was not done adequately such that civilian deaths were excessive for the particular objective, but it is difficult to argue that important targets cannot ever be targeted for risk of civilian death; if that is the case then the risk is all militarily important persons and equipment will be placed within these regions. When the military chooses civilian infrastructure that civilians are using or are near to, such as hospitals, schools, churches, mosques, etc., then they are placing their own people at risk. If they are doing so in an attempt to minimise their enemy's response or maximise the moral outrage of allies when civilian deaths are publicised then they are making a strategic decision, but one that carries significant responsibility—the responsibility for the lives of those civilians. Whatever the guilt, or lack thereof, for the death of these civilians it lies primarily with the combatants and their commanders who have acted in this manner. There may be situations where opposing troops end up in populous regions but this is a different situation. The moral responsibility for the death, injury or even risk when civilians are forced to act as human shields is clearly those doing the forcing. Though given that such civilians may switch allegiance in this situation it would be prudent for the opposing army to take this into consideration with regard to long term strategy. However civilians who act as human shields voluntarily are in a different situation. One can argue how "voluntary" the action is, which is a legitimate concern; but in situations where civilians are doing this of their own volition they are actively participating in the war. They are not just choosing a side—many civilians are on the side of their own army, though not always—they are joining the battle and thus it could be argued that they have become combatants and as such are as legitimate a target as any soldier. Their blood is on their own head. Combatants posing as civilians carry significant moral responsibility. 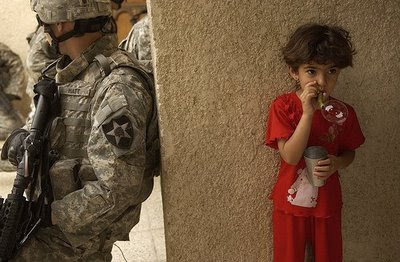 Whereas a combatant hiding amongst civilians may be thought cowardly; one who disguises himself as a citizen such as a labourer, a merchant, a woman; or as a humanitarian worker such as an aid provider, a nurse, a doctor; while actively fighting places those people at risk. The reason for this is that they will subsequently all be seen as possible combatants. If 3 of 10 emergency food truck drivers are combatants who engage the enemy from this position, how is the enemy to know that the other 7 are not also combatants? If the real aid workers end up dead in the engagement then the blame is with the disguised combatants, not their enemies who fired the fatal bullets. Lastly, intentionally increasing the death toll of your own citizens for propaganda purposes scarcely needs commenting on. All this does not have significant bearing on the justice of one's cause nor the rightness of engaging in war. If your cause is wrong, even if you avoid civilian casualties, your cause is still wrong. If your cause is right, you can still make right and wrong decisions in how you seek your cause. We must be careful not to justify evil behaviour because we agree with the cause. Various commentators and news outlets have expressed opinions about the current conflict in Gaza. It is difficult to know all the relevant issues from a secular viewpoint with much misinformation, lies and propaganda. On the side of the Palestinian cause are arguments about Israel blocking access along the borders of Gaza, specifically Egypt and the Mediterranean, and the involvement of Israel in creating their enemy. Arab support is also along the lines of mutual ancestry, mutual religion and mutual hatred for Israel. On the side of the Israel cause are arguments about right of defence, right of conquest, larger concessions in negotiations. This on the background of a repeated stated desire of their enemies to completely annihilate them. There is some support from some advocates of democracy because of Israel's political structure. Several Christians are sympathetic to Israel because of their eschatological beliefs. Without discussing the merits of these arguments nor resolving the various rights of both parties, I wish to comment on the ethics of the warfare and tactics as it relates to this conflict. I will discuss proportionality here and civilian casualties in a later post. A lot is being made of the proportionate response theory. The idea being that the defence against an aggressor is proportional to the attack. This appears to be analogous to the principle of talion. The difficulty here is that talion limits the punishment for a crime committed by an individual. Under this principle a murderer can be put to death but a assaulter cannot be. You can force a thief to recompense his victim (and fine him) but not cut off his hand. The number of casualties in a war is the sum of all individual deaths. However the idea that total number of deaths is comparable does not automatically follow. Each individual has died, but the addition of one individual's death to another does not seem to make sense. Granted, mass death seems more horrible than individual death, and it is. But even with a single death, that person has still died. If a serial murderer is put to death for his crimes, he is only executed once. It doesn't matter whether he killed 3 people or 27 in terms of the degree of his punishment. We don't go and find 26 of his acquaintances to execute to even the numbers. One could argue that victim proportionality can be applied to warfare even if it cannot be applied to serial murder because an army has a chain of command. But war is also an act of the state, not of individuals; and it is to individuals that talion applies. Suffice to say that totalling deaths to assess "proportionality" lacks any convincing principle and appears simplistic. I am not even certain that "proportionality" by any metric is a required ethical aim for warfare, as opposed to, say, the combatant/ civilian distinction. But assuming proportionality, as so many do, a more rational approach to proportionality is to look at intent. If soldiers from 2 countries are fighting each other, the fact that 1 side is more successful in killing the other side just reflects their better ability. Both sides are continuing to fight. Where proportionality potentially comes into play is when 1 side surrenders. Significant ongoing warfare after surrender (and agreed terms of peace) could be argued as disproportionate. So if Hamas continues to fire rockets into Israel, even though Israel has killed more Palestinians than Hamas has killed Israelis, then the response by Israel can hardly be described as disproportionate. Now it is important to note that Jesus was talking about joining the kingdom of heaven: men should consider all the implications of following Jesus. Jesus is not necessarily justifying some wars, nor is he commenting on the righteousness of the king's cause. But he is making an observation about kings that his hearers would have understood: when rulers know they cannot win they show prudence by negotiating. The principle of proportionality also allows the aggressor disproportionate positioning. The aggressor can attack at will and the response is dependant on the attacks. This allows the aggressor to optimise his position and fight as munitions become available, knowing they will never be attacked at a greater level than they inflict. If this is disputed then why do those who hold to proportionate response not ask the aggressor to cease fire then the response to cease? Note that with individuals the wrong is with the aggressor (if it is not then they are not punished) and a proportional punishment against him acts as a limit on further activity. With warfare the aggressor may not be in the wrong and even if they are a proportional retaliation does not limit further activity. None of this states which party is morally right or wrong in the situation. There have been cases when the righteous have won battles and wars and cases when they have been defeated. Physicist William Happer is another global warming sceptic. He has recently joined the more than 600 scientists on the Senate Environment and Public Works Committee list who deny anthropomorphic global warming, although he has been a sceptic for longer. He makes an interesting comment about a time when he was managing a $3 billion energy research fund. People are excited when you are interested in something they find fascinating. They often want to tell you about it and explain how they see it. A stand-offish attitude is an unusual response, especially if it applies to a group with a shared interest rather than a single quirky individual. Not wanting to answer questions about climate change, or offering to find the answer you desire in advance does not disprove the theory of global warming. It does however raise suspicions about the persons involved in the research. Their integrity is questionable*. One could say, "It is not the theory I question, it is my trust in the theorists that is lacking." *This does not necessarily apply to every global warming insister. Several may be happy to explain the theory, offer a reasoned defence of it, and share their data. Further, deniers who do what I am condemning are just as wrong. However this is less likely for deniers in the current environment because the deniers are challenging the accepted dogma. The reigning paradigm is accepted as the default position. I use Firefox as my default browser. I have tried several, shifting to Opera several years ago because of tabbed browsing, though migrating to Firefox shortly after its release. I like the idea of competition in any area and during a relative monopoly this means being prepared to support smaller parties, even if they offer a similar rather than superior product. I am now using version 3, though I held off switching my home computers till the first revision. Despite beta testing, bugs seem to be found quickly in x.0 versions of software and it seems prudent to wait and download x.0.1 or x.1 versions. There are 2 features I find very useful with Firefox. The first is the new address bar in version 3. For those who do not use version 3 or use some other browser this is an extremely helpful feature. Firefox searches thru your history and any word/ phrase that you type that is found anywhere in the URL address or in the title of the webpage is offered as a suggestion. If you were reading an article (or 2) on Saturn and the title of the page had the word "Saturn" in it, then type in "Saturn" in the address bar and all the pages will be offered in the suggestion box. The suggestions are sorted according to frequency of page loads and how recently the page has been visited. For frequent sites I do not frequently use clickable links or bookmarks, I type the first few letters and select the site. The 4th search I have set to searching for web addresses that are not linked. Sometimes web addresses are given but are not anchored to their page. I highlight the link, right click and select find web address. These searches or web address lookups occur in the background while I continue reading. The dictionary is obvious. Wikipedia I use for basic information on topics or people I am not familiar with. The Bible search is also very useful. When verses are referenced but not quoted I highlight the reference and the page loads with the relevant verse(s). Also when reading or writing (blogging or comboxes) I can highlight a phrase (ie. not a verse reference) and search for that phrase within the Bible. Text: Search dictionary for "$"
Text: Search ESV for "$"
Situations which can have 1 of 2 outcomes are considered Boolean. Here are several notations with typical correspondence in the same column. If we follow our own trail, at the end, where are we? But following Waengongi's trail, at the end we come to his place. He has made us a place where we all can live happily and in peace.